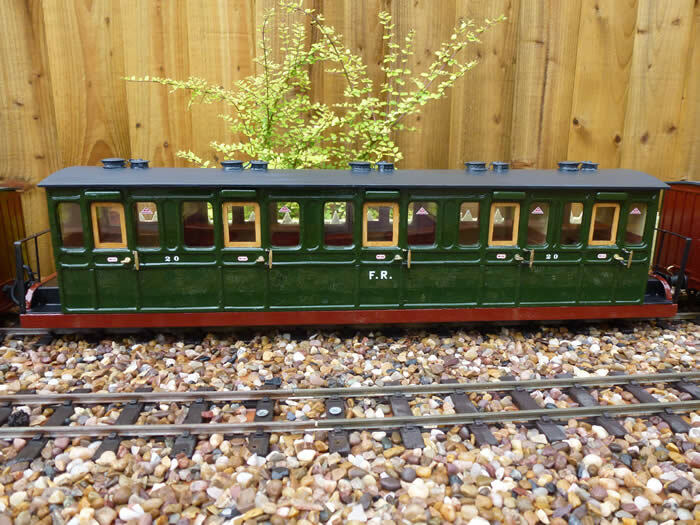 Sitting on the shelf in my shed was a very worn Brandbright PS19 Freelance panelled bogie coach I built about 15 years ago in maroon and cream livery. 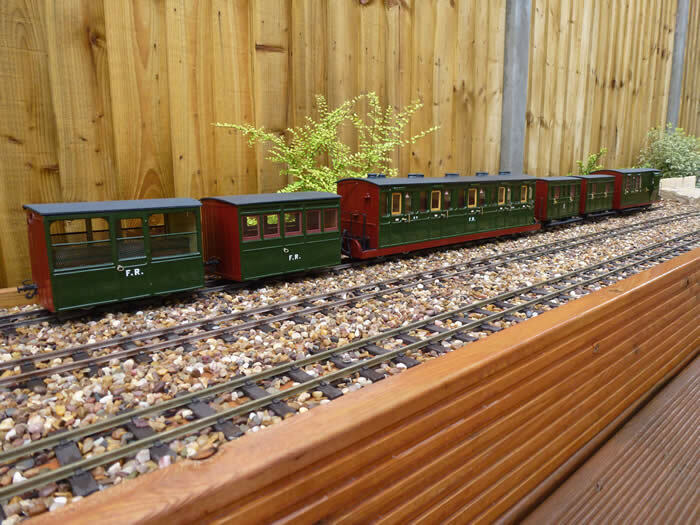 After more than a decade of running around garden lines in Yorkshire and two years languishing on a shelf it was in a sorry state. 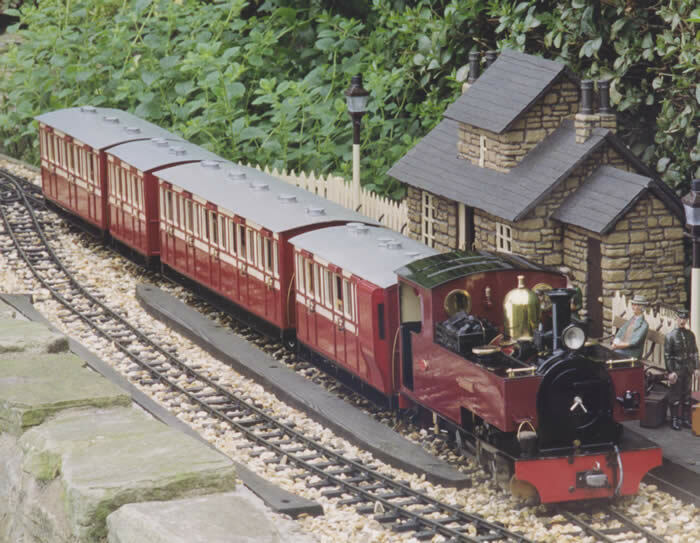 Roof and sides were unglued, paintwork was scratched, glazing had fallen out of windows, footboards were hanging off and doorhandles broken or missing. It had to come apart for a serious overhaul if it was going to run again. So, having taken it apart to restore, inspiration strikes! 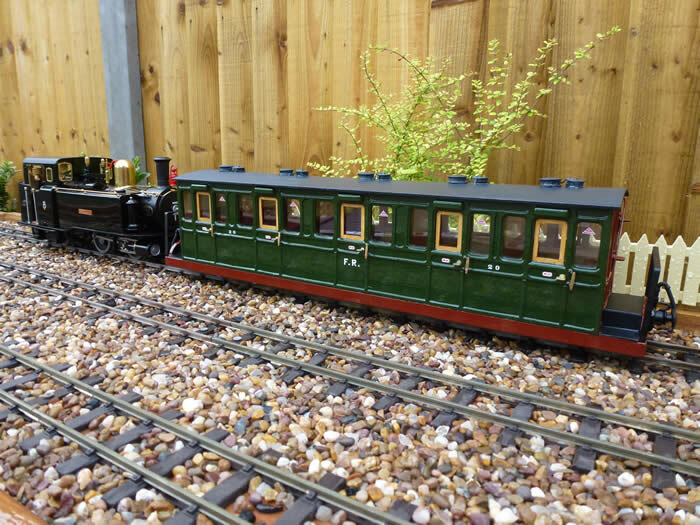 Why does it have to go back together in exactly the same way……For about the last year I have been building the rake of Ffestiniog Railway 1930’s coaches in the Colonel Stephens era livery of dark green sides and red-oxide ends to run behind my Roundhouse Taliesin. 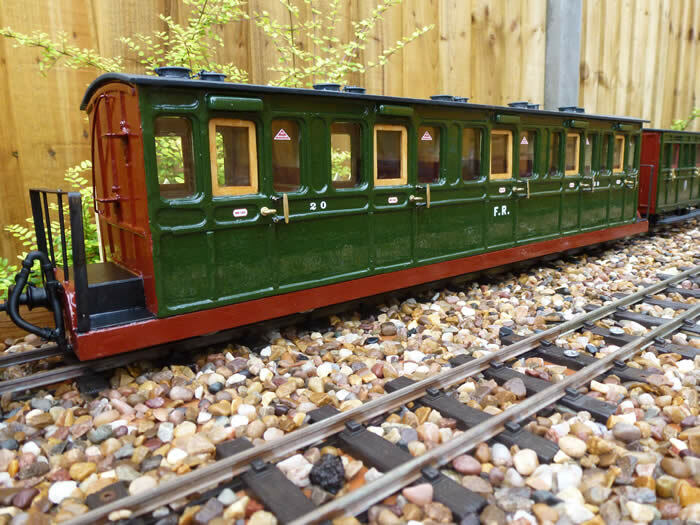 My next project was going to be one of the bowsider bogie coaches, No.20 to fit in with the 1930’s rake. Adapting the PS19 seemed like an easy way to achieve this, as no kit is available. Sure, the sides wouldn’t bow and I would be a compartment short, but I’m not intending to count any of my rivets, so to speak. What the PS19 did have was the panelling already done on the sides. 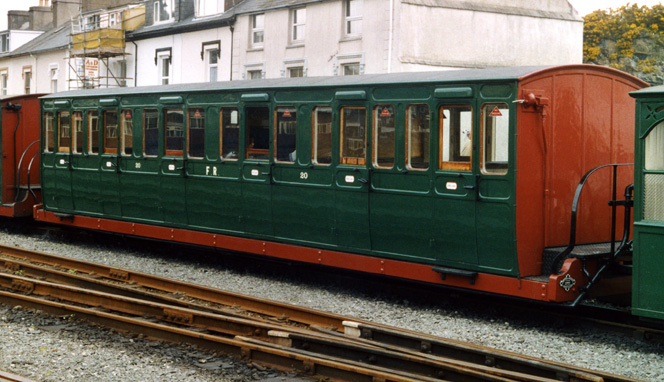 A website I use a lot for reference is www.festipedia.org.uk which has a wealth of information about all things Ffestiniog past and present, along with lots of good photos. The 1930’s train can be found at www.festipedia.org.uk/wiki/FR_Carriage_Formations#The_1930.27s_Train. I soon realised that, along with being much too high from the rail, the PS19 was also too wide and would need significant alteration. I also realised that my enthusiasm was past the point of no return so out came the hacksaw. I built a whole new subframe so the bogies sit much further up underneath and used this to create the stepover balcony ends. 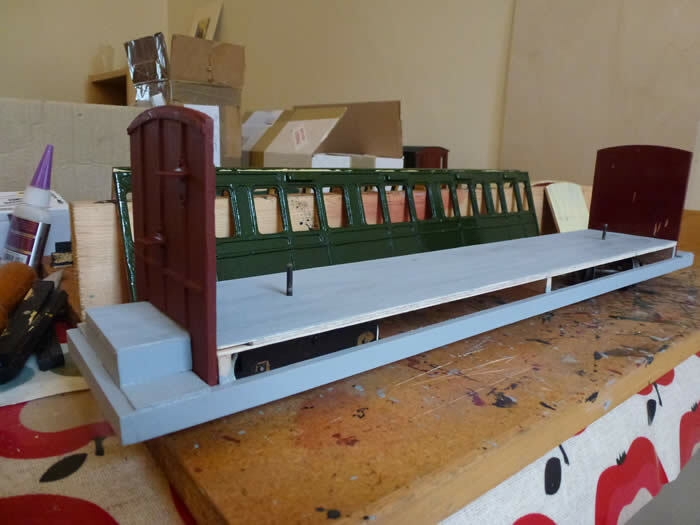 The ends and compartment partitions from the original kit were narrowed by 3mm each side to bring the width into line with the rest of my Ffestiniog stock and a new roof was cut out. 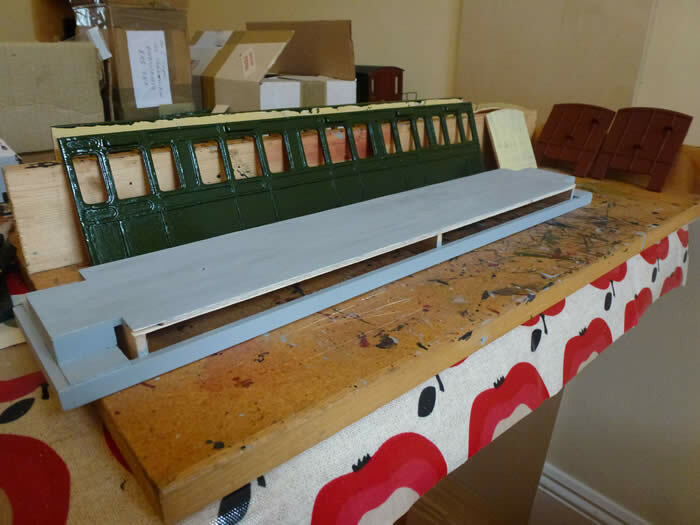 The whole coach was sanded and the parts given 3 coats of paint before re-assembly. I soldered up some thin brass strip for the balcony handrails, salvaged what doorknobs and handrails were useable for the sides and replaced the rest with new from Brandbright. 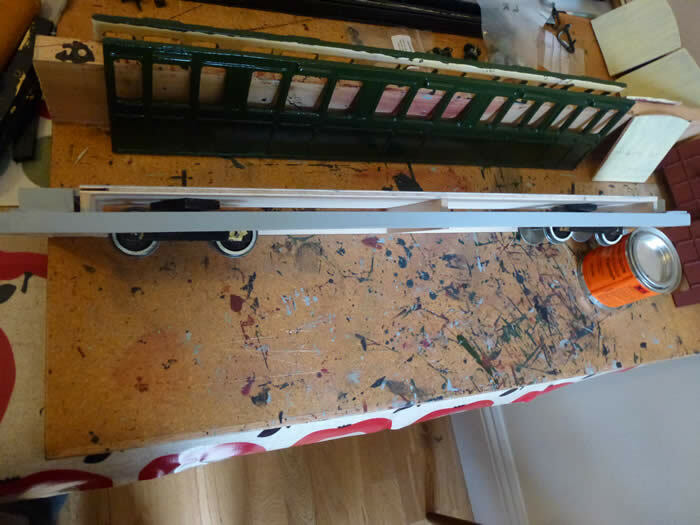 New droplights were cut from thin ply and the coach was reglazed. 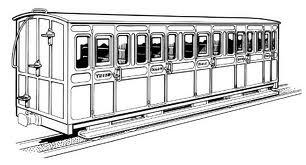 The interior was painted cream with wooden slatted bench seats for the Third Class compartments and unpholstered (red felt) seats in the First Class. Transfers from DJB and a coat of gloss varnish complete the effect, turning the elderly PS19 into what I hope looks roughly like FR No.20.